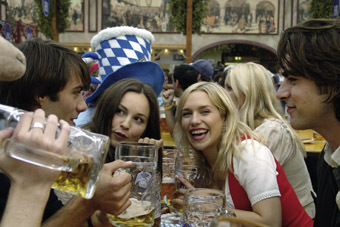 Oktoberfest tells of people who meet on the last day of the Oktoberfest, lose one another, then find each other again. These little and big stories track individual destinies drawn to one another, converging at the festival. A handsome Italian falls madly in love with a Japanese woman he meets in a festival tent... Tamiko, who happens to be on her honeymoon, realizes that her husband can’t hold his liquor... At the same time, the waitress Birgit has second thoughts about her marriage to Max, a musician at the festival... Talla, a dishwasher from Cameroon, hopes that he will find the courage to admit his feelings to Birgit... 16-year-old Jenny has her own problems. She loses her little brother Marc in the crowd. In her search she meets her father, who is there trying to end an affair with a student... While this is going on, Marc follows his new mentally-retarded friend Karl to the Haunted House... Edmund, Karl’s grandfather, knows that he doesn’t have much longer to live... Wheelchair-bound Frank, who only pretends to be handicapped, can’t get out of his lie without hurting Rena’s feelings. Like the gondolas of the ferris wheel, the individual stories spin around an axis, are held together and put in motion by it. Sometimes they reach the same height, sometimes just a glance of one another, but they are always in motion. The stories all occur simultaneously, and are dramatically linked and interwoven. The shared surface of these stories is the Oktoberfest. There the various episodes find their beginnings, and sometimes their end. The Oktoberfest is over ... What is left? Johannes Brunner studied Sculpture before turning to film. His films include: 5 Stuecke (video installation, 1993), aqua in bocca (video installation, 1994), Die gesteigerte Fahrt (1996), Vom nassen Tod (short, 1998), Getraenkemarkt (video installation, 1999), VEX (video installation, 1999), Twiglight (video installation, 2000), and his feature debut Oktoberfest (2005).